Out of the box the Mac Pro 2008 is a great machine, but is looks a bit dull. It’s perfect for some internal lightning though, since it already has the ‘cheese grater’ perforated front. This is ideal for the CCFL light to shine through. I have pimped them both, so lets me show you how to add some bling bling to your Mac Pro or PowerMac G5! CCFL means ‘Cold Cathode Fluorescent Lamp’. Basically, it’s a lot like TL, but it’s available in a lot more colors, which makes it interesting to use for adding some serious glow to your workstation or gaming set up. CCFL is not better than LED light per se, but it usually looks much warmer and shines much more diffuse. It can also add an unbeatable glow to your machine, as you can see in this picture. This weekend my trusty old PowerMac G5, well, sort of died on me :(. Fortunately, I still have the pictures of it’s CCFL shining away in the dark hallway. 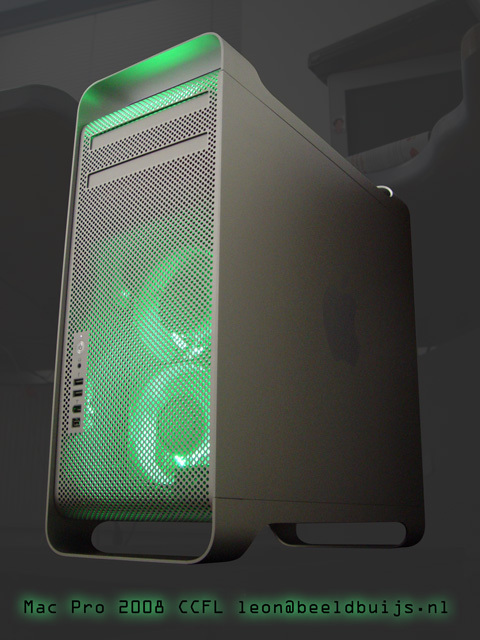 The PowerMac G5 as discontinued in 2006, but it is still a popular machine. The Intel Mac Pro models that replaced it have cases of the same dimensions. They differ at the inside but as far as case modding with CCFL goes, they are all very suitable for adding CCFLs. The inside of the Macs Pro models are designed tightly and tidily and they deserve to be seen. Every computer nerd loves to see the nice Mac Pro interior, but you’ll have to light it first. Normally, it is to dark to see anything of the beautiful detailed interior from the outside. Adding the CCFLs is easy. They usually come with velcro stickers. This is good for a quick fix, but the glue tends to dry out after some time, so you might want to use small tie wraps or some electric wire. For this G5 I used mostly 4 inch CCFLs at the bottom. I wanted to make sure that all of the CCFL light goes to the inside of the case first. Therefore, I stuck some mirroring sticker foil to the front half of the CCFL, so the light that used to go to the front is now reflected back into the PowerMac. I also mounted some curved CCFLs in front of the fans as you can see. I go into that more deeply while looking at a Mac Pro 2008 with green CCFL lights. Mac Pro Fan Unit with CCFL mounted on it and a blue inverter box (r). Although a new, completely redesigned, late 2013 model Mac Pro is announced, it’s not for sale yet and the ‘big old aluminum Mac Pro’ is still going strong. The Mac Pro case is more spacey on the inside than any other Mac and therefore has plenty of room for extra’s. CCFLs are commonly available in 4, 12 and 15 inch lengths, but circular models also exist. I’ve never encountered them for sale as a separate item, so I bought replacement fans with CCFL on them. You’ll find them in 80 mm and 120 mm. For the large Mac Pro fans, the 120 mm suits best. The Mac Pro fan unit can be easily slit out, making it easy to mount the CCFLs. I carefully used a dremel and a file to get rid off the parts of the fans I didn’t need. Keep in mind that CCFLs are very easily broken. Just like TL and other high voltage type lamps, they contain heavy metals like mercury, which are very poisonous, so handle them with care and if they break, dispose them in the proper manner. Don’t use a vacuum cleaner, for example. I kept the plastic enclosure intact so I could reuse it. Instead of drilling, I used just a few drops of melting glue to fix the enclosures to the fan unit. 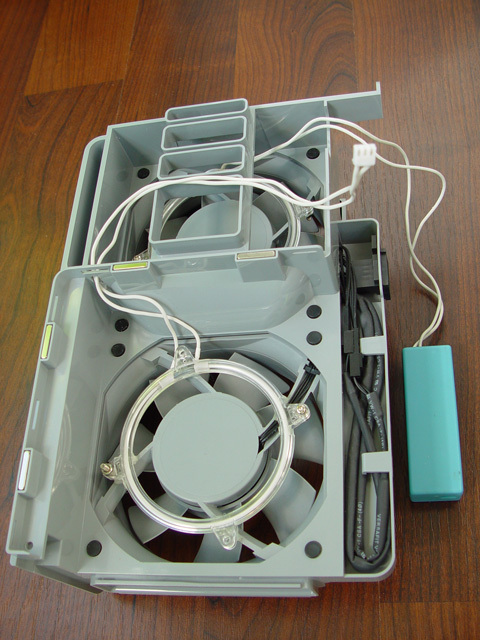 The advantage is that you don’t damage the fan unit and you can always remove it again without residue or holes. You need a molex connector to power the CCFL. However, there are no molex connectors hanging loose in the Mac Pro, like in most PCs. Still, you can find one tucked away in the top compartment of the Mac Pro, in the back of the second drive bay. This is mend for Mac Pro Blu Ray burners. With a little effort you can route it to the bigger center compartment. CCFLs come in almost any color like green, red, blue, yellow, orange, purple and ‘black light’ ultra-violet. However, there are of course a lot of variations in these colors. If you want to be sure CCFLs from different brands really have the same color, check for the color wavelength. Here’s a chart of the colors of the spectrum with the wavelengths. CCFL lights typically come with a small power supply box called an inverter, velcro and an on/off switch, so you can always turn the lights off whenever you please. I took most photo’s with very little light, so the CCFL lights up nicely, but with daylight the effect is less bright. There are also sound activated CCFLs available, like the one I used in the video. Keep the wires of the CCFL away from the wires of the fan unit, else the Mac can get ‘confused’ and makes the fans go full speed all the time. I think this has to do with the temperature sensor being affected by the high current of the CCFL.